A guide to some of the best small markets on the island. When people speak of markets on Ibiza they are usually referring to the two famous hippy markets, Las Dalias and Punta Arabí. It's worth seeking out some of the smaller ones for their local feel and their local products and produce. Whilst the bigger markets sell things from around the world that are associated with Ibiza's bohemian past, these markets have local in mind. Whether you fancy some hand-crafted jewellery or accesories, original art, fresh friut and vegetables or a nice gift, you are sure to find something local and special at one of Ibiza's more compact markets. Read on to get the low-down on a more authentic slice of Ibiza. Located in San Antonio's old town close to the church on Saturday evenings and all year around, is this new market. The colourful stalls offer everything from hand-made handbags, original paintings as well as things like organic fruit and vegetables. This market sells a range of vibrant clothing from t-shirts to multi-coloured ponchos, there's even shirts made from bamboo fibre that are nice and sustainable. Stallholders are mainly locals ofering a variety of goods like handmade jewellery, bags, clothing and even teas. You will also find locally grown vegetables and Ibizan hierbas liqueur. Live music and bands perform every week and a there is a variety of fun activities to keep children entertained. Taking place during evenings in summer and daytimes in winter, it's very pleasant strolling and stopping to pick up some inventive jewellery or even a mandala to hang at home. Forada market was started to support local farmers and producers to help self-sustain the community around it. Located next to the famous art cafe Can Tixedo in this tiny village it has a real country feel being next to fields and is just a few kilometres from San Antonio or San Rafael. Much of the focus is on selling items that are grown or made on the island, with local artisanal, and natural products. 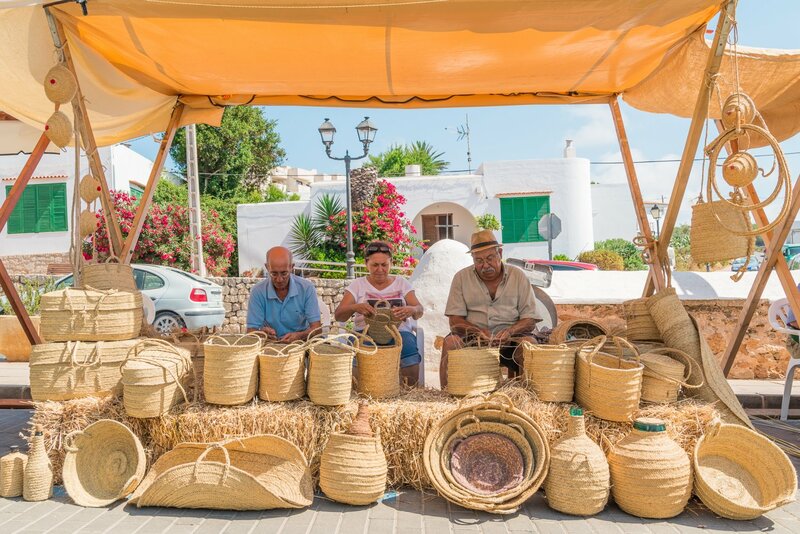 See stalls selling natural cosmetics, ceramics, products made from Ibizan aloe vera, fresh and organic fruit and vegetables, local honey and handmade preserves. A lovely little market, it runs each Saturday from morning to late afternoon throughout the year, sometimes with live performances of world music. If you're feeling hungry, stalls sell things to eat such as a veggie paella or you might want to pop across the road to the art cafe for a sit-down meal that's reasonably priced. This market has a special appeal and is one of the most "local" on the island. A great eco-market located in the charming village of San José run by local people selling local, organic products, including fresh fruit and vegetables and homemade pastries as well as paintings and handmade ceramics. Expect a range of stalls offering a colourful collection of hand-crafted accessories including beaded necklaces and bracelets, hand-made fans and woven baskets. If you fancy a quick rest, then there is a stall with the opportunity to sit and get your hair braided. Check out the hand-knitted dolls, wooden instruments like carefully crafted flutes, engraved drums and much more. Workshops are offered occasionally and are fun and educational, with opportunities to take part in baking bread, making compost and growing herbs and on how to help the environment. Markets like this one are popular with residents and tourists that want to experience a market that again puts the accent on local. This is a summer market only, running mornings each Saturday from mid June through to the end of October. Note: the market's last stand for 2018 will be this Saturday 20 October. During the summer season, there are numerous street hippy markets most days of the week, either all day or during the evening only. They have much jewellery, accessories and some clothing You'll see them in places like Figueretas along the promenade or down the narrow streets of the old port quarter La Marina in Ibiza Town. San Antonio has a night market on its main promenade and Playa d'en Bossa has a compact market tucked away in a side street between the main roads of the resort. For a slice of market life that is more traditional Ibiza, these quaint little markets will leave you delighted at their simple charms.